More than a year ago, I wrote a post about the launching of a new range of luxury motor catamaran designed by Porsche under the management of Royal Falcon Yachts. I went back on their site and saw that new drawing and 3ds are online. So here they are. 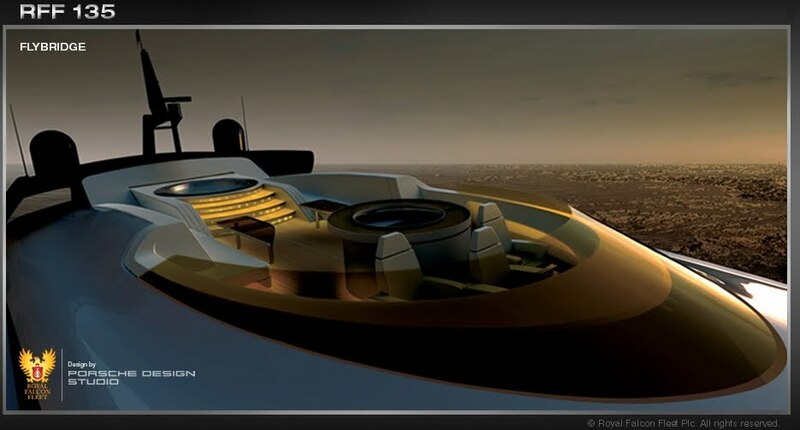 I could not find any information about one being built right now in the website but found the link to this Telegraph Article saying one was being built and due to be launched at the end of this year at a price of £35 m.
Not so easy to sell and to buy, so Royal Falcon Yacht has set up a fractionnal ownership program where you can become the owner for 4 weeks in a year. They plan to build up to 98 yachts, to cater their owners all around the world… which will take them about a 100 years to build !!!! If any one knows the shipyard, let me know. This entry was posted in power catamaran, rff 135, rff 210, royal falcon fleet. Bookmark the permalink.